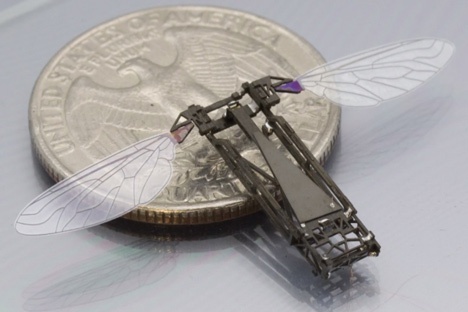 Though it weighs in at just 80 milligrams, you’ll definitely want this little RoboBee in your corner. Designers Kevin Y. Ma, Robert J. Wood, Pakpong Chirarattananon, and Sawyer B. Fuller at Harvard School of Engineering and Applies Sciences, in collaboration with the Wyss Institute for Biologically Inspired Engineering, followed nature as their guide to create the world’s first insect-scale robot that mimics the behavior of a honey bee. This is the second robot to join the museum’s collection; the first was a robotic vacuum cleaner. In comparison, RoboBee shows a departure from strictly functional to biomorphic robot design. Because the creation of an autonomous robot on such a small scale required entirely innovative approaches, the project represents a huge step forward at the intersection of science and design. RoboBee’s morphology is complex and tailored to mimic the anatomy of a honey bee. This tiny robot with a carbon fiber body has wings made of polyester film membrane stretched over a carbon-fiber composite frame, and wing transmission consisting of polyimide-film flexural hinges with carbon-fiber rigid links. Robobee is able to move by using artificial flight muscles made from piezoelectric ceramic, carbon fiber, and alumina ceramic. These artificial muscles contract when voltage is applied–not unlike the functionality of real in vivo muscles, which contract when they receive electrical signals called action potentials from synapsing nerve cells. The creators of RoboBee embraced the idea of nature as the paramount design model. The creators focused on three aspects of RoboBee design: body, brain, and colony. The design for the body developed from the necessity for RoboBee to fly independently when powered by a discrete, completely integrated power source. Brain development involved the creation of sensors that mimic the eyes and antennae of a bee, so that RoboBee can sense and respond to its external environment. Additionally, the capacity for colony interaction is an important component of RoboBee design; a swarm of RoboBees can coordinate behavior to function as a single unit, mimicking a hallmark behavior of honey bees. RoboBee creators pioneered a new technique that they dubbed “pop-up book MEMS” for this manufacturing feat. The technique fabricates multi-layered and multi-material structures, layering the materials in sheets that can essentially be folded up into the final structure, pop-up book-style. But why make a robotic bee? The designers of RoboBee explained, “For us, bees are something of a metaphor. They are social insects; they interact with the environment and with each other in ways that make the whole greater than the sum of the parts.”[i] The creators envision a variety of uses for RoboBee – creative, unexpected uses, including search-and-rescue missions and covert surveillance. The most practical application of RoboBee, however, is the artificial pollination of crops that have been affected by CCD, or Colony Collapse Disorder. While pollination by Robobees would certainly temporarily help to restore crop populations that have suffered from the disappearance of bee colonies, it would only be a Band-Aid solution to this environmental concern. Yet RoboBee’s ability to make small strides provides evidence of the potential this technology possesses and inspiration for how designers may approach creative solutions to large-scale issues. Kaitlin Macholz is a summer 2016 Peter Krueger Intern in Cooper Hewitt’s Product Design and Decorative Arts Department. She has a BA in Art History from Williams College, Williamstown, MA. [i] “The RoboBees Project and Colony Collapse Disorder,” Wyss Institute, accessed August 4, 2016, http://wyss.harvard.edu/viewpage/536.